I was feeling particularly depressed. I had just lost all my emails, and that was only one of a number of computer issues that I have recently suffered. I needed to get out. But I knew that the need to fix the PC would soon draw me back home, so I opted for the short trip to Lambert Park, Sandy Bay, in search of newly arrived Swift Parrots. 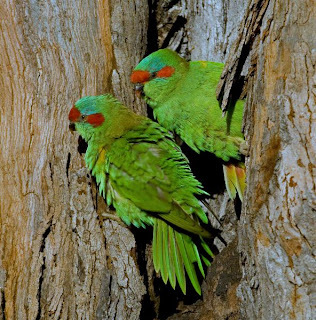 Arriving, I was confronted by the screeching of Musk Lorikeets as I opened the car door, but I thought I also heard a couple of Swift Parrots calling. I could be in luck. This time of year a couple of years ago, in this park, I watched a flock of about 40 Swift Parrots, feeding on the ground, I think it was probably on elm seeds. A repeat of that was uppermost in my mind (briefly forgetting the PC!). Unfortunately that wasn't to be, and I had to settle on watching other parrots. The Blue Gums were in full flower and the Muskies and Eastern Rosellas were making the most it. 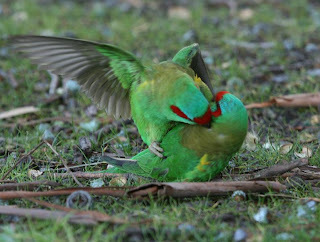 There were several Galahs and a few Green Rosellas to add to the list of parrots. Only a few metres from the car, several pairs of Musks were embroiled in a melee on the side of a eucalypt, with one pair appearing t o defend a possible nest hole, about 3 metres up. The brief scrum over, I was intent on finding out whether they were indeed setting up home, and I took the accompanying images while I watched. The two birds sat at the entrance hole, and the male (based on the greater amount of head colour), splayed its tail, and quivered its body feathers. After doing that several times, they took to mutual grooming, mostly of neck feathers, before flying down to the ground. 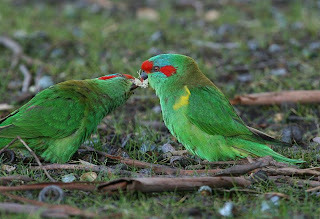 The male lorikeet then searched among the many gum flowers littering the ground, before presenting one to its mate (upper left image). Further mutual gro oming, and an attempt at coition, which if it took place, was over in the blink of an eye, was followed by rather more aggressive 'grooming', as shown in the lower left shot. The two birds then sat side by side for sometime, before flying off. 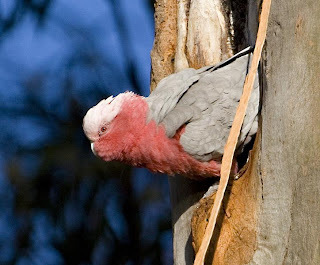 A few metres higher up the tree, was another potential nest hole, this one defended by a pair of Galahs, in between bouts of chasing other pairs around the area. Having failed in my primary goal of finding Swifties and feeling somewhat invigorated by all the action, I decided to widen my search to nearby Truganini Reserve. But that's another story! 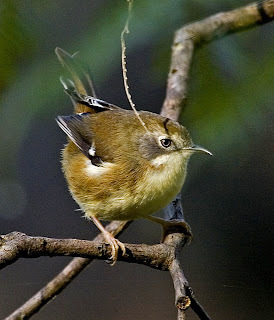 I received an email from Eric Woehler (Chair of Birds Tasmania), with an attachment outlining a possible Darter sighting and a request from the observers for help. The sighting occurred during a wildfowl count at Moulting Lagoon on Tasmania's Eastcoast, about a week ago, and the following is a precis of the event. During a pre-count briefing it was emphasised that if any unusual birds were seen, to take notes and talk to the organiser about it (Stewart Blackhall) rather than just add it to the list. He mentioned that in the past a Darter was reported, but he was unable to confirm it. This caused some mirth among the seasoned birders, as a Darter would indeed be an unlikely sighting in Tasmania. On a beautiful calm day, the 4 observers in question, Ron Nagorcka, Ross Monash, Louisa d'Arville and an unnamed parks field officer, headed out on the Sherbourne property in the north-western arm of Moulting Lagoon. During the count, made with the aid of a spotting scope, they counted many wildfowl, especially Black Swans, some Grey Teal, Crested Grebes and cormorant. While doing a count of the cormorant numbers, Louisa excitedly noted a much larger cormorant among the Little Pied and Little Black Cormorants, all grouped together on an old, dilapidated hide. When this 'cormorant' turned its head, it showed off a long, slender, very straight, bright orange bill, with the orange seemingly stretching back behind its eyes. The bill was on the end of a long snakelike neck. After watching it for some time, noting its distinguishing features, they consulted the field guide. The longer tail, large body, long neck and sharp, unhooked bill, saw them all concluding that it was a Darter. Ross and Louisa have both lived in Queensland and seen Darters before, as has Ron. They did manage to get some, in their words, "blurry photographs", by digiscoping with a camera that was about to run out of battery life! While not ruling out that it could have been a Great Cormorant, the 4 agreed that the bill was different to any cormorant, lacking the hooked end, but the all black bird lacked any white markings on its face, neck or wings, often seen in Darters. The following day a number of observers went in search of the "darter", without success. From the above, the 4 birders are requesting your assistance if you're heading for Moulting Lagoon. If you wish to go to the Sherbourne property, which is private land, or you would like more details on how to get there and how to get permission to go on to this property, you may contact Stewart Blackhall on 62336585 or Louisa d'Arville on 62238905. Denizens of the Deep.....Shade that is! After several days of birding the South Arm area, yesterday I decided to try my luck in some of the wet forest areas, and opted for a visit to the Wielangta Forest. Specifically, I birded both ends of the Sandspit River Track, in fact I have to admit to never having walked the whole length of this track, perhaps this Summer? I stopped off at the picnic huts at the southern end, noticing that the sun had yet to clear the tree tops, so the area was still in deep shade. I always listen out for the resident male Pink Robin here, and wasn't disappointed, noting another 'Pink' answering his call from the other side of the road. I walked a few yards, looking for the robin, without success, and anyway deemed the area too 'gloomy' for photography, and set off for the northern end. While still at the northern car park, getting geared up, I noted several more Pink Robins calling in the very still conditions. 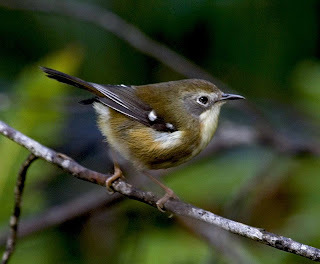 Tasmanian Thornbills scolded me from the riverside vegetation, and I could hear a distant Golden Whistler calling, as well as a nearby Scarlet Robin. As I neared the forested area, I realised that although I had recorded several species, I had seen very little, and this seemed to be the norm for much of the next couple of hours. The lesson here is, make sure you know your bird calls, otherwise you could have a very frustrating visit! I heard numerous Eastern Spinebills and Strong-billed Honeyeaters, but saw neither. I did see a few of the numerous and very vocal Crescent Honeyeaters, and a glimpse of an Olive Whistler, a common, but retiring resident. I arrived at a spot where I've photographed Scrubtits on previous visits, and I hope d for a repeat performance. The area is primarily of Man Ferns surrounded by thick scrub, with overmature acacias growing up through it. It's main attraction from a photographic stand point, is that a recently dozed firetrail runs close to it, allowing more light into the area. Despite that, it's still not the easiest of spots, and I usually manage to collect leeches as I wander through it, one of those beings that I have an unhealthy loathing of. But, at least on this morning, it proved to be worth the effort, as I quickly found the resident pair of Scrubtits. 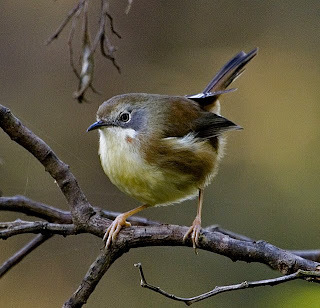 Scrubtits are thornbill size birds, very active, and often shy, The accompanying images are a few that passed muster, most exhibiting movement of bird or camera, or both, in the less than ideal conditions. Perhaps that's why there seems to be so few images of Scrubtits to be found on the www. Eventually, the pair just disappeared into the scrub, and that was that. I wandered a little farther down the track, but apart from a fleeting view of a Brush Bronzewing, little else was seen. Time to call it a day, well, morning. I did however stop at the picnic huts on my return journey, and w alk down to the creek, hoping to see the Pink Robin, which I did, but also in search of more Scrubtits, which I didn't. 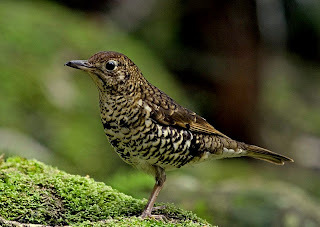 But I did spot a Bassian Thrush, scraping among the leaf litter in a verdant patch of rainforest. Despite the dingy conditions, I took several shots while it continued feeding. Later, looking at enlarged views of what it was feeding on, I was surprised to see that its prey was mostly winged insects. It continued feeding despite my close approach, and I eventually managed to get a few usable shots, including the accompanying image. For those of a photographic bent, the image was taken at 1/20th second, with a tele lens and no tripod, which says a lot for the Canon image stabilisation system! At least these thrushes do spend a lot of time standing stock still, in much the same way as their cousins, the European Blackbirds do, in many of our suburban gardens.Eventually it flew up onto an overhanging branch some 6 or 7 metres above me, which was something of a surprise, as I've rarely seen them more than a few metres above the ground, they were after all known as the Ground Thrush for many years.